Get a look at the fascinating wildlife, indigenous culture and military history of the Philippines on this day trip to Subic Bay from Manila. Tour the Subic Naval Base with your knowledgeable guide, then learn jungle survival skills from the indigenous Aetas people at a training camp. Afterward, take a Jeep ride through a tiger enclosure on a Zoobic Safari, or be entertained by performing dolphins and sea lions during a marine animal show. Lunch and transport are included. Start your day trip with pickup from your city hotel in the morning, and relax on the scenic drive to Subic Bay, located 75 miles (121 km) northwest of Manila. Your first stop is the Naval Base Subic Bay, once the largest overseas military installation of the US until it was abandoned after the 1991 eruption of Mt Pinatubo — located just 20 miles (32 km) away and considered the second-largest volcanic eruption of the 20th century. Tour the massive former naval facility with your guide, who explains how the area was converted into a modern free port with numerous sights and activities. You’ll learn about the important role the shipyards played during the Battle of Manila Bay and the Philippine-American War. Enjoy a Filipino lunch at a local restaurant around midday. First, head to JEST (Jungle Environmental Survival Training) Camp to watch a show by the Aetas — the indigenous people of the Philippines — who demonstrate the skills needed to survive in a tropical jungle. After lunch, it’s time for your wildlife experience. Board a safety-protected Jeep for a ride through a tiger enclosure on the Zoobic Safari. The only one of its kind in the Philippines, the adventure brings you up close to these majestic big cats. Or, you can choose to watch the comical antics performed by trained sea lions and dolphins at the Ocean Adventure. At the end of your full-day tour, you’re taken back to your hotel in Manila or Makati. The ride out was long and boring but sadly that was the best part of the day. The safari was horrible. First the animals are caged in small cages under filthy conditions and this cruelty to the animals should be justification for closing this place down. A baby tiger is chained up and what appeared to be drugged to keep him lathargic for photos made me cry. The safari is riding around in a small pen attracting starving tigers with raw chicken. Deplorable. I went for the scenic vista advertised on the teaser but when I showed it to the guide the response was I have never seen a place like that. No other guides could identify it either. I feel this was over sold by the operator. We did not stop at US Naval base and very light explanation was given. The wildlife experience protected jeep is only 5 minutes out of 2 hours within a zoo and some poor attractions. Extremely disappointed, especially considering the price of the tour. It wasn't even a Subic Bay trip. All we saw was the Zoobic Safari and that was it. My husband retired from the US Navy and wanted to reminisce the times he was here but we didn't even see Subic Bay. All of us in the tour felt the same way. It was a total waste of time and money. 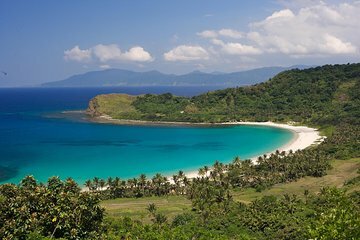 One of my most memorable experiences of my Philippines trip was my tour to Subic Bay where we got to go swimming and shopping in the warehouse store that had Dr. Pepper, Burberry, and Polo shirts for reasonable prices. First started with an emailing confirming tour day and pick up time,0800. The tour guide was waiting in our lobby right at 8. This tour is GREAT!!!!! Our guide was so knowledgeable and really went out of her way for us. They took us to a church and she had one of her friends that knows that church well give us a tour and really explained the history to us. It was about a two hour drive but she kept us busy with all of the facts and great conversations. Once we got to the jungle survival demonstration at Subic Bay, we ordered out food and sat for the demonstration of how to make utensils and also how to cook rice out of bamboo. The 2 guys that taught that were so nice. They even let us taste the water out of the tree branch and sent us home with 2 cups and a spork made from bamboo. Lunch was amazing!!! I know many Filipinos that lived in the Philippines that never got to have food out of bamboo. Great experience! You only spend enough time at Subic Bay for lunch and so on. As for the zoo, we really enjoyed the tiger area. As far as everything else there, not really worth time if you've been to a zoo before. We had extra time so out guide took us to a couple souvenir shops and even the local SM store. We went on a different tour after this one and it did not compare. I HIGHLY RECOMMEND THIS TOUR!!! to start out it was not that great we got an email telling us our pick up time would be between 9:15am and 9:30Am when we got to our pickup location the actual pickup time was 8am. But, after a little while they did get us a driver and guide who by the way where wonderful can't say enough about them. On our way we went and the trip was beautiful. The only other problem was because of the late pick up we did not have enough time to do the Jest course which was very disappointing. Subic Bay had a brilliant trip to San Fernando where we viewed a buried church after a volcanic eruption. The mud slid down from torrential rain and the church was filled with mud up to the second storey bell tower. Our guide and driver looked after us and gave us front row seats in all events. We visited JEST the Jungle Environmental Survival Training Camp. Here the local indigenous peoples shared their bush knowledge in survival with us. Very interesting. We went to Subic Zoo. The tigers were a close encounter. Felt sorry for the situation of other animals in their very small and cramped housing. The lunch and singing resturant was fun. A big day with alot of driving but the adventure was well worth it. Not our favourite tour but still a good one if you have a full day to spare. It rained all day, except when it poured. Could barely make out the bay from the shore and it made no sense to try most of the outdoor activity. Traffic in and outside Manila was even worse than usual, and usual is terrible. The guide and driver went out of their way to try to salvage the day, and if and when I return to the Philippines, I might try the trip and hope for a better outcome. Oscar, our guide, was very knowledgable. The tour ran a bit longer than expected due to heavy Manila traffic that day but the time was well spent.